Sometimes the best solution to a problem turns out to be a simple one. This is indeed the case with StackHR, which fundamentally consists of two long pipes (one placed inside the other) wrapped in insulation and cast into a concrete slab. Its simplicity helps to minimize costs which is essential to the project. 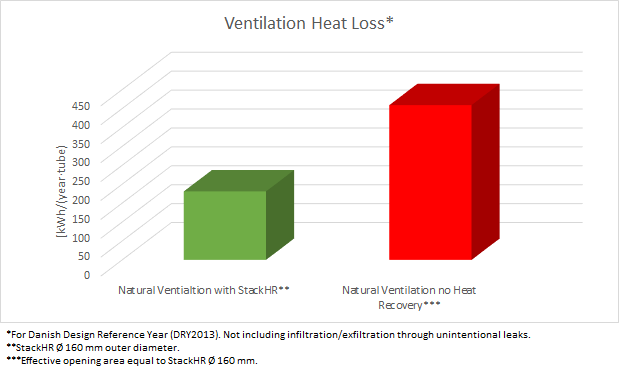 A short return of investment time is essential in making StackHR a viable alternative to less sustainable ventilation solutions. In addition to being simple in design, StackHR is also very intuitive for occupants to use. When it's cold outside people tend to not ventilate enough leading to low indoor air quality. This is also the condition under which StackHR delivers the largest amount of fresh preheated ventilation air. When it is warm outside people tend to open windows to allow cool fresh air in; this correlates with StackHR not delivering much ventilation air due to low stack effect. This means that no advanced controls, instructions, or special behavior is required from occupants for StackHR to function optimally. While natural ventilation does not use electricity for mechanical fans to move ventilation air, energy is still lost in the form of heat removed with exhaust air whenever it's cold outside. StackHR can cut this energy loss by more than 50%, thereby benefitting the environment and the building owners wallet. The purpose of StackHR is to provide a good baseline ventilation air flow rate that can be supplemented by other ventilation strategies if/when need (e.g. opening of windows). Calculations show that a 6 meter long StackHR tube with an outer diameter of 160 mm will provide an average flowrate of just over 2.5 L/s over a year under typical Danish weather conditions. With a standard deviation of 1.2 L/s over a full year the flowrate can be considered fairly stable. As a rule of thumb 10 L/s of outside air for each occupant in a space is necessary to achieve a good indoor climate. Four tubes per occupant will therefore generally suffice. For added flexibility more tubes can be installed during construction and left capped initially. These can then later be opened if a higher ventilation rate is needed. StackHR introduces slab penetrations for supply and exhaust pipes making for slightly more complex structural calculations. Luckily these penetrations are away from the middle of the span where bending moment forces are the highest. By reinforcing the area with penetrations the same shear strength as with a regular hollow core concrete slabs can be achieved. StackHR only works for multistory buildings (the more floors, the higher the overall efficiency). StackHR is not an HVAC system, and as such is suitable only for cold or temperate climates where mechanical cooling is not needed. Occasional cleaning of the tubes is required as particles will settle in the tubes during operation (a silver lining to this is that particulate pollution that settles in the tubes doesn't enter the ventilated space, leading to improved indoor air quality). StackHR requires building envelopes and ventilation zones to be relatively air tight for the ventilation to function correctly (in most developed countries air tightness of new construction is already required by law). StackHR works best for ventilated spaces that only borders the outside environment with surfaces facing in one direction so that large wind pressure differentials don't occur. If a ventilated space has surfaces that border the outside and are facing in several different directions, ventilation openings must be limited to face in one direction only as to avoid cross ventilation bypassing the heat recovery system. These limitations mean that StackHR isn't the perfect ventilation solution for all buildings, but for a lot of construction projects StackHR provides a unique opportunity to save energy, space and money while improving indoor air quality for occupants.